Yesterday was my last day of classes for this school year, so this afternoon, I’m headed to Tokyo, where I’ll be meeting up with my parents, who are visiting for the next week and a half. We’ll be in Tokyo first, then Kyoto and the surrounding Kansai region, and finally–after a quick stop in Fukuoka–we’ll come back down to Kazusa. This should be a lot of fun and will hopefully make for some interesting posts, but since I’ll be traveling a lot during their visit, I probably won’t have time to write many updates for the road. All my students passed their high school entrance exams (phew). GO ORANGE! Although it pains me that I haven’t been able to watch any of their games live this year, I was finally able to listen to today’s Sweet 16 game on the radio, and I couldn’t be happier. Syracuse is back in the Elite 8! Let’s punch that ticket to New Orleans, baby. Okay, that’s all I’ve got. Over and out. It is a truism of life abroad that you come to expect the unexpected. I think this is probably true of everyone’s experience at one time or another, but for clueless me, it’s practically a way of life. Last week, I was invited to dinner at a colleague’s house. The circumstances were celebratory, as our students had just graduated, and there were a number of other teachers and staff also in attendance. The dinner was phenomenal (homemade fried chicken and gyoza, or potsticker-style dumplings), the company well-lubricated. After dinner, at the behest of those assembled, I was obliged to reveal a few of America’s more… shall we… colorful crudities, in exchange for some of the same in Japanese. Since you’re no doubt wondering, “trouser-snake” was the best received. As the evening went on, someone mentioned Mt. Unzen, the active volcano which is also the highest mountain on the hanto and its most popular destination for sightseers. 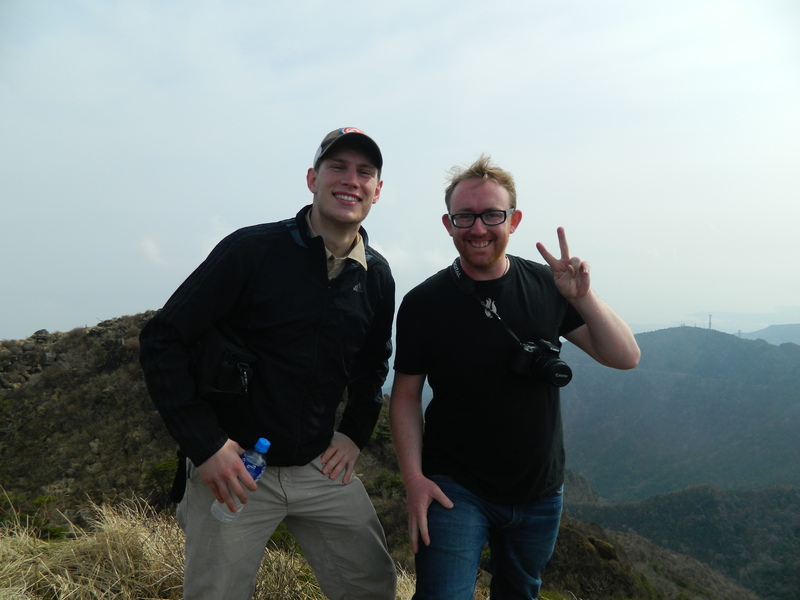 I hadn’t climbed Unzen yet, but wanted to, and said as much. 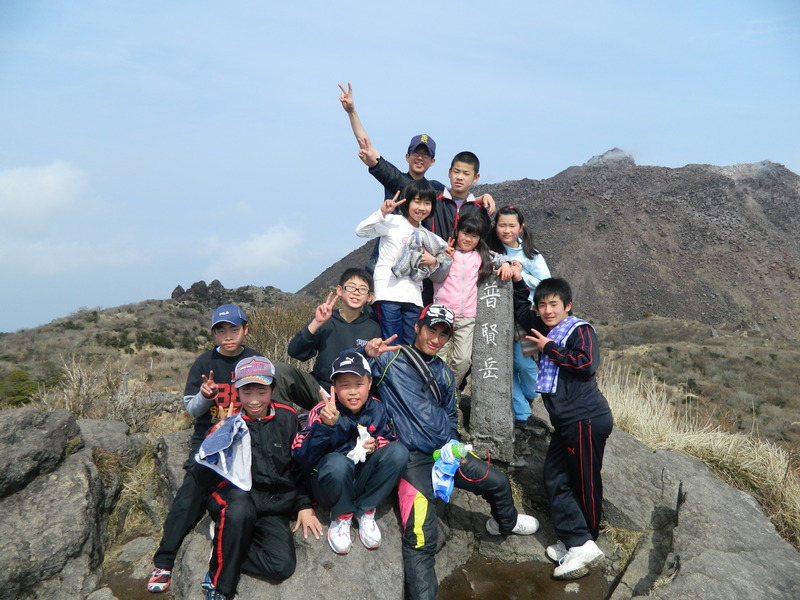 Well, as it turns out, one of the people at the table was planning to a lead a group of the just-graduated elementary school 6th graders on a hike up Unzen the next Tuesday as a sort of send-off. And, Tuesday being a holiday, wouldn’t I like to come? Sure, I would. Why not? 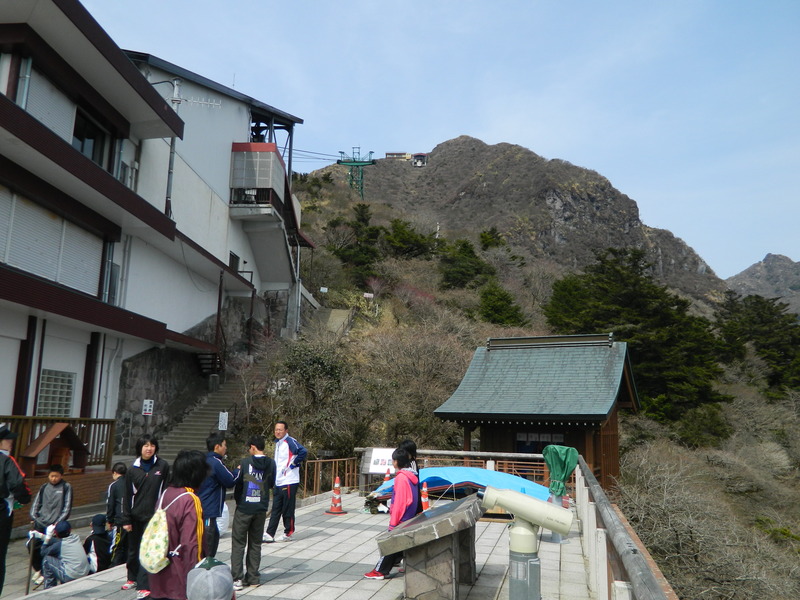 I wanted to climb Unzen, and better still, this was an opportunity to get to know some of my students a little better to boot. An ideal way to spend a midweek holiday, to be sure. Now, I was told that the hike would take all day, which I found surprising given that Unzen–as climbed from the most popular starting point at Nita Pass–is only a handful of kilometers each way, a few miles at the most. And while the elevation gain was reasonable, I was under the impression that it could be done quite leisurely in a couple of hours. But I didn’t question the estimate. After all, things take longer than you’d imagine in Japan, what with the opening ceremonies, the closing ceremonies, and the other random niceties which must be observed. And, of course, doing anything with kids takes twice as long. Pictures will be taken, lunches will be eaten, and with all that factored in, you’ve nearly filled the day right up. So on Tuesday morning I hauled my habeas corpus out of bed at 5:15 and arrived at the school half-an-hour later. There were already students and families assembled. I piled my backpack into a car and tried to half-listen as some speeches were given in Japanese. Then, after some clapping, the male students–and the trip-leader who had invited me–walked out of the parking lot. I just stood there. One of the things that happens to you when you don’t understand the language is that you become rather tentative about taking any definite action. It’s easier to avoid faux pas through inaction, so unless I’m told explicitly otherwise, I find myself playing “wait and see” to determine if something is okay. Well, after a few seconds, one of my colleagues explicitly yelled at me, “Go!! !” And with that I shuffled off after the group. As I jogged to catch-up, I admit, I was confused. Aren’t the cars back there? I hope we aren’t going to do some warm-up or something. I didn’t wear my running shoes. Aren’t the cars back there? It wasn’t until we passed the junior high school, and the playing field, and the edge of town, that I realized: those cars weren’t for us. We’re walking. The whole way. All day. Now, while this came as a surprise to me and me alone, it wasn’t cause for too much concern. After all, my cohort consisted of two adult men and two dozen chicken-legged prepubescent boys. If they could do this, surely it would be no problem for bacon-eatin’, beard-growin’, horse-tamin’, tree-cuttin’ American Man. It also didn’t seem like cause for concern because I had no idea how far it actually was, only that it was farther than I had expected. Well, I know how far it is now, give or take. Google Maps lists the distance at around 32 kilometers, or about 20 miles, which doesn’t account for elevation-gain. 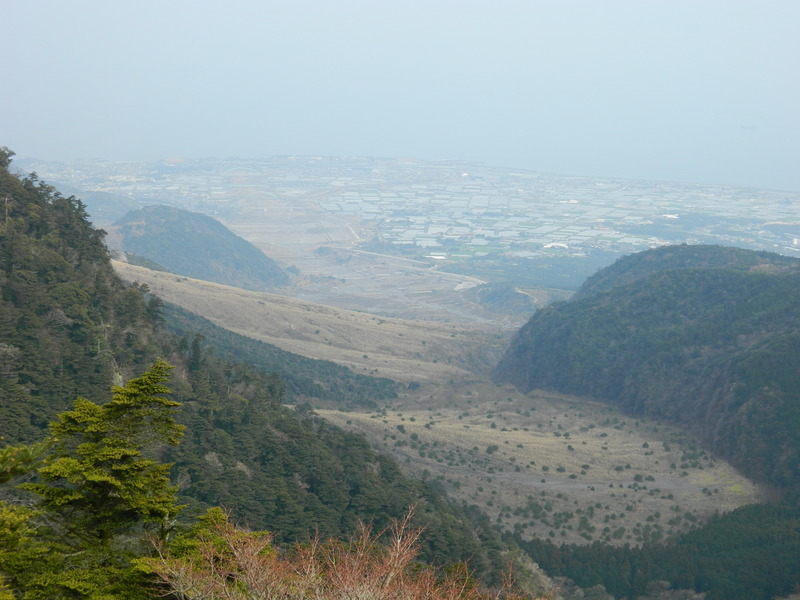 (We started at sea-level, and Fugendake–the highest accessible, non-volcanic peak–is 4,459 feet.) I suspect that the distance is slightly less than that, since we were off-roading from time to time, but not considerably so. 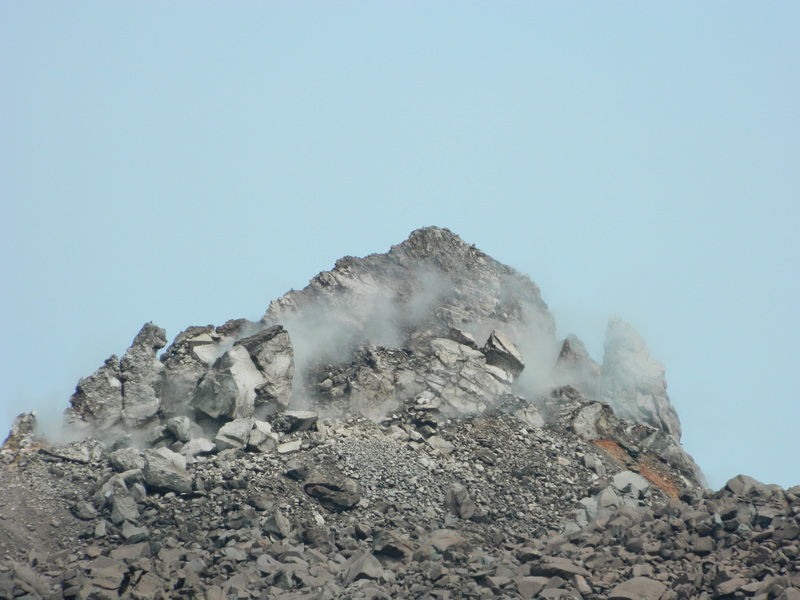 Heisei Shinzan, the active volcano peak. And indeed, it took all day. We left at 6:00am, we reached the summit around 3:00pm, and I got back to Kazusa (by car, this time, from Nita Pass) at just before 5:00. There were a number of stops along the way. Although only the 6th grade boys, myself, and the two trip-leaders completed the entire trip on foot, we were joined for long portions by mothers, fathers, brothers and sisters, both older and younger. (The female 6th graders met up with us at the first stopping point and completed the remainder of the trip, probably the last 75 percent.) It was actually quite the community event, with support vehicles driving by periodically with candy, water, and the like. And everyone climbed the last stretch together. In the meantime, the kids turned me into a human Yak Bak, saying Japanese words in strangely-inflected ways on command. And while this did get old (for me, not for them) after about the 60th phrase, if you can’t handle something like that for a couple of hours, this job probably isn’t for you. I don’t have to tell you how remarkable it is that a 20-mile uphill trek is considered a popular community event for 12-year-olds and their parents. It’s true that Japanese kids looooove video games, but unlike too many American children, they also do stuff like this to balance it out. I can’t imagine something like this drawing anything but ire from the majority of American students. They wouldn't let me take the gondola to the top. A good look at the path of destruction wrought by the last eruptions (1991-95). Although entirely unexpected, this was a wonderful event, and I’m glad to have been a part of it. Unfortunately, if a 20-mile walk is a rather vigorous test of healthy knees, my left failed. It didn’t keep me from summiting, and didn’t even slow me down too much, but it did hurt–quite a bit by the end of the day. And if, as the doctors at Aino told me on my last visit, there was “no problem,” that shouldn’t be the case. If you’re a doctor (or play one on TV! ), and want to help me plot my next move, you know where to find me. One of the principal differences between the education systems in America and Japan is the way the two view continuity. Internationally, Japan is often depicted as a country rooted in tradition, devoted to its culture heritage and slow to embrace change. Of course, this is a gross simplification, as modern Japanese have repeatedly demonstrated a willingness to pursue fundamental changes that remake their society, first during the Meiji period, then after World War II, and most recently, in the wake of the Tohoku earthquake. Still, Japan is, and will likely always be, a country where ancient customs and rituals have their place. Conversely, America’s reputation–much of it self-cultivated–is of a country constantly changing, adapting, and updating, always tearing itself down in order to build anew. Although our political rhetoric sometimes runs counter, I think most Americans see their country and themselves as forward-thinking and future-conscious, in the vanguard of change rather than back amid the peloton. Yet, as far as public education is concerned, it is America that embraces the status quo, while Japan encourages–nay, demands–a cycle of constant change. The tenure system has been a hallmark of American education for almost a century now. It is widespread (though not ubiquitous) in both public and private institutions, at universities and secondary schools throughout the country. And while the tenure system has been hotly debated and somewhat diminished in recent years, it remains a part of the American teaching landscape at all levels. The basis of the tenure system–(he wrote, without doing any research)–is, at least partly, that continuity is an educational virtue. I believe that most Americans would subscribe to the idea that teachers and students both benefit from a measure of security and stability, that it allows trust and rapport to develop in a meaningful way. As evidence of this, I submit that, in my experience, many of the best and best-loved teachers I have known spent a decade or more plying their trade at a single school. In Japan, this pretty much never happens. Why? Because, usually every three years or so, teachers in Japan are subject to transfers. Let me explain. Teachers here are contracted, not by individual schools, but by the Board of Education. (I’m not sure if this is the same in America.) The BOE operates on two levels, municipally and prefecturally. Every year, the BOE selects a group of teachers, though how they do this is not known to me. Those teachers are then reassigned to a new school, typically somewhere else in the municipality, though sometimes elsewhere in the prefecture. Why do they do this? Well, as with many things in Japan, I don’t know exactly what the official rationale is. But it’s clear that the process is designed to do two things: encourage egalitarianism and ward off complacency. The Japanese want to ensure that the best teachers get spread around evenly and that no school be mired indefinitely with second-rate staff. In theory, this also gives teachers a chance to learn new skills, by forcing them to interact with an entirely new set of colleagues every few years. And, since teachers are constantly adjusting to new schools and having to prove themselves anew, there’s really no room for presumption. The teachers themselves have no control over their fate in all this. They cannot dictate where they transfer. They cannot decline a transfer without resigning their position. They don’t even know, until the selections are announced, whether they are up for a transfer or not. They are, more or less, helpless at the hands of the BOE. As you can imagine, this is a source of stress for many teachers in Japan. They’re basically never given a chance to get comfortable in a school, since the prospect of a transfer looms at the end of any given year. For the lucky ones, a transfer will send them to another school nearby, meaning a different commute but no drastic measures. For the less fortunate, a transfer can mean uprooting their entire life, or even their family. This was a surprise to me, and probably to her, too. Just six months ago, she returned from maternity leave. She and her husband have two children, both under 5-years-old. She has never set foot on Tsushima Island, but between now and mid-April, when the new school year begins, her entire family will relocate there. She will be missed dearly here in Kazusa, but Tsushima is supposed to be beautiful, so perhaps the island life will agree with her. And if not, there’s always next transfer.